This was the second ‘Five Grasswren’ birding tour run by Southern Birding Services, with slight modifications to the itinerary – the main one being the addition of an extra day to reduce the amount of daily driving. 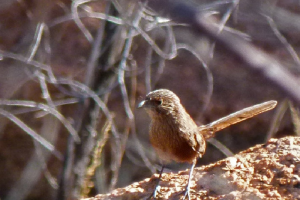 The aim was to find half of all of Australia’s current Grasswren species in South Australia’s mallee and the remote Corner Country: Striated Grasswren, Short-tailed Grasswren, Thick-billed Grasswren, Eyrean Grasswren and Grey Grasswren. Unusually high rainfall over the past few weeks, and indeed during the day before the tour, had left the outback landscape in excellent condition, with green vegetation and water all around. All target species were found, as were a good number of other rare, specialised or endangered outback species.